Room a bit loud, people above us were very noisy. Would have liked to have a hand towel and face washer in the room and the bath was really dirty. excellent stay,will be using your facility again. Great stay again. I like the location and the security. Will certainly book again next year. The staff were very friendly and helpful. The location was excellent for getting into the Melbourne CBD. The room was clean,well serviced and the bathroom was very spacious. It was great. I wanted a place that was easy to find from the airport. Some on was there when we arrived. Thanks so much, the one bedroom apartment was perfect for our stay! Overall quite happy with our stay. As the apartment building is quite old, the staff need to pay close attention to maintenance items to keep this up to date, especially the bathroom which was weakest link. Comfortable and what we needed for a 2 day visit to Melbourne. Conveniently located, clean room & clean linen, pleasant staff, sufficient breakfast for low cost, will be visiting again. The room was clean and comfortable. Staff were very accommodating when we returned late for our check out. This is a very good value facility in an older building but my double room with internet had a good new bathroom and the site is well placed for public transport if you dont have a car. Some food outlets nearby behind the gas station opposite, otherwise a tram trip to Flemington shops where there a re great restaurants like Lasa King. A night time walk the five to the shops not recommended though. We were very happy with the amenities and location. The Park Squire Melbourne apartment was everything we required. The Staff were very helpful. For us - value for money. Only one thing public should be aware of is having to carry luggage up 2 flights of stairs. Not a problem for us but could be for others. This was the third time we had stayed and the previous visits had been lucky to get a room towards the rear of the motel which is quiet. I know this time we got the last room available so it was just bad luck to be close to Flem Rd where the traffic goes all night. That night the people in adjacent rooms came back after midnight and talked out on the balcony til about 3.30am which was a bit unfortunate..then we got a couple of hours sleep til the alarm went off on the digital clock...which hadn't been set by us! So it was an interesting night, not your fault, but you did ask! We would stay again but only if we could get a room at the back! Apart from that it's a good motel to stay at. I have been a repeat customer for many years. This testify to my satisfaction of the motel. We are living in the apartment, big fridge and very tidy kitchen with our necessary pans, plates and other things, so we can cook the food for our baby. Nice size lounge with dinning table and LCD, enough for small family. Overall we were extremely pleased with our stay. Very clean rooms exellent bathrooms and lots of space in apartment. No problems at all, would have liked some pegs for the clothes line! Very comfortable, staff were approachable and very helpful at all times. Cleaning staff were A1! We were only there for 1 night but it was good. Location was very suitable to our needs. Room was comfortable and clean. Excellent convenient location, very comfortable and affordable accommodation with friendly staff. 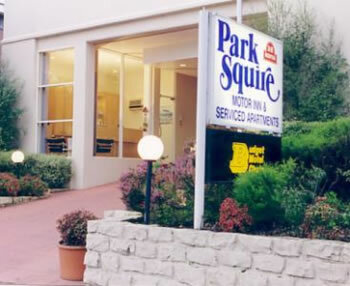 We have stayed at Park Squire on many occasions and will continue to stay there. We were very comfortable but the climb of all the stairs to the top of the 3rd level was a bit much for us over 60 year olds.Especially when it came time to take up and bring down the suitcases. Next time I will make sure I ask for a lower level. Great place in Melbourne, right next to a tram stop so easy to get to and from town. Very nice - exactly what we were looking for! Thank you. Wonderful holiday visiting my son and his wife who live just around the corner from you. I will be back every three months for another visit with them and you. Had a lovely time! Was a convenient location with easy access to public transport. We have stayed with you before and will stay again. Very handy to the airport and excellent value for money. Very happy with the service, clean linen, towels, room & a good budget holiday appartment close to the city, markets,trams & easy to find when not a local& friendly heplfull locals! Thank you. Thankyou for all your help, I was so pleased I was able to stay an extra couple of nights.